Dr Neha Arora is an alumnus of the esteemed KLE University, Belgaum. She has completed her master's in Conservative Dentistry and Endodontics. 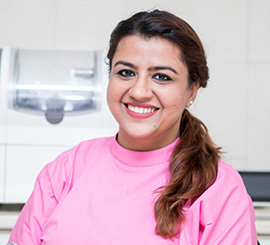 Not only she is one of the best endodontists in Delhi, she is also trained in the use of microscope and is a firm believer of Micro-endodontics. Before being associated with The Sterling Dental Clinic, she was previously associated with Maulana Azad Institute of Dental Sciences, Delhi. During her Post-Graduation, she developed an inclination towards Aesthetic Dentistry. In her own words,“If endodontics is my brain, aesthetics is my heart. Designing a smile for a patient to bring back his/her confidence is what I strive for." She has national and international presentations and publications to her credit. She is a life member of Indian Dental Association and Indian Association of Conservative Dentists and Endodontists. She is devoted to her profession and keeps herself updated with newer and innovative technologies such as LASERS, Ultrasonics, the new Zoom and Cerec Dentistry. Combining the scientific knowledge and an aesthetic eye helps her give a personalised wholesome care to her patients.